While still in the final editing stage of “That They Might Fly Again – Part 3”, I have commenced the 2013 shooting schedule of interviewing and gathering flight footage for TTMFA Part 4. That is where Ike and “The Miracle Maker” came in. I met Ike by referral from his friend, also a premiere pilot and warbird owner, Greg Shelton. Greg performs aerobatics in airshows across the USA and South of the Border. Greg’s Fighter of Choice is the Wildcat and he will also be featured in Part 4 of my series. There is just way too much to tell about Ike in this installment of Sky Surfing. You’ll just have to watch Part 4 of the series when it comes out… Suffice to say, Ike and his beautiful wife Liz have a wonderful assortment of aircraft and own a large flying service in Canada. They also have acquired a number of hunting and fishing lodges. That’s why I said in the opening line that they reside “part time” in Tulsa. During the “warm months” (in Canada that means the couple of months some of the snow melts…) they head North to attend to the lodges leaving the red dirt of Oklahoma behind. I contacted Ike this Winter to see if he would be interested in participating in the series. After some discussion as to my aims and what would be required of him, he heartily agreed. After that, we stayed in contact alert for auspicious occasions upon which I could conduct two interview sessions I needed. Also opportunities to shoot some action footage of the Mustang. 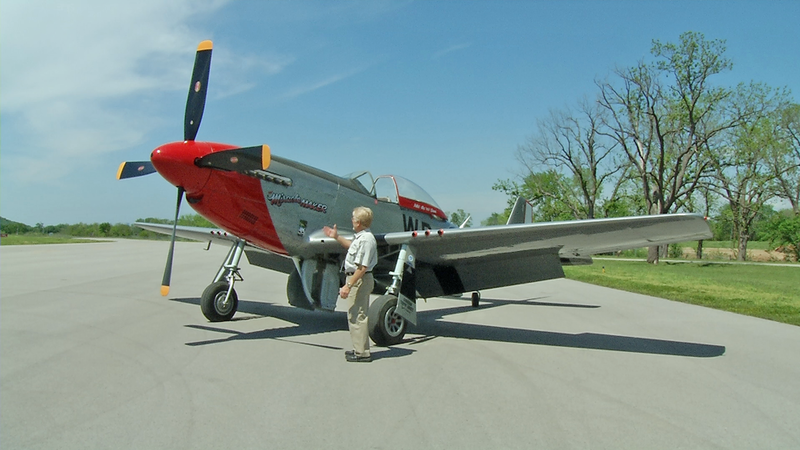 On Tuesday, the 7th of May, we were able to taxi the P-51 out on the ramp so Ike could perform a “walkaround” on camera and describe this most famous of WWII Fighters in great detail. 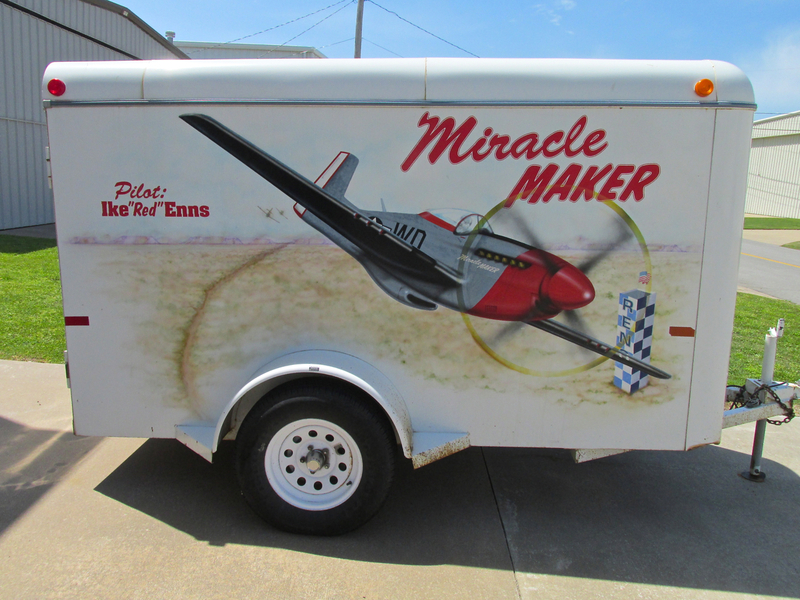 I am very happy to have Ike and “The Miracle Maker” in my movie. While those who own and fly their own P-51 Mustang are all members of an unquestionably select group, I believe Ike stands alone in this crowd for a number of reasons. 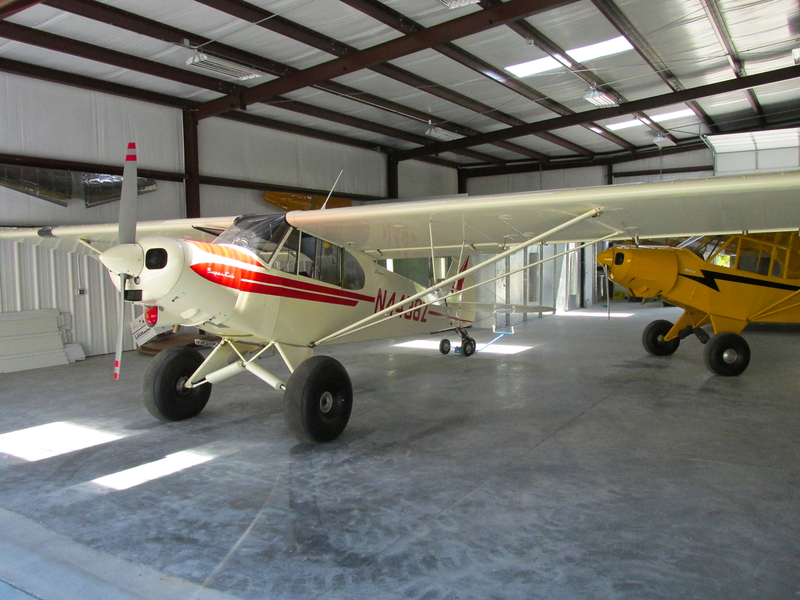 First, he has owned “Miracle” for 20 years and has flown many hours in it in all types of conditions. Second, he knows it inside and out. 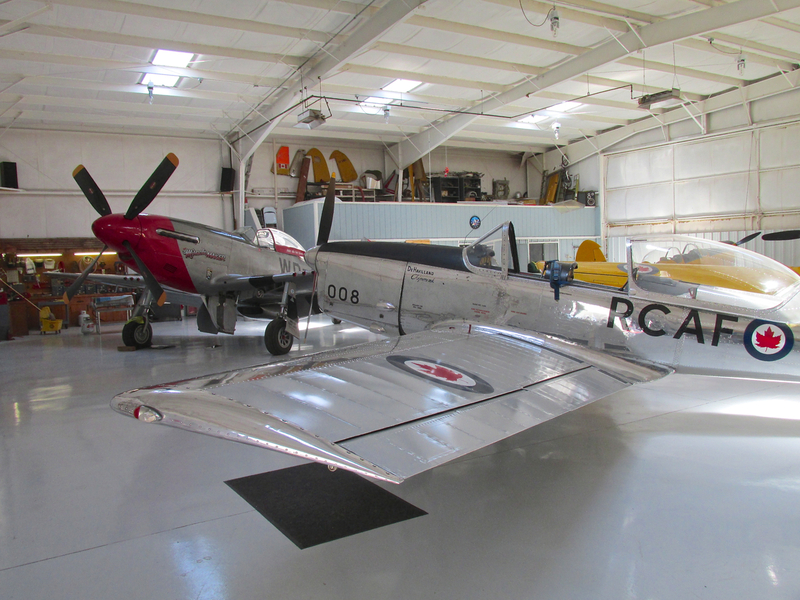 Because he is also a certified aircraft maintenance technician (known in Canada as an aircraft maintenance engineer), Ike is intimately familiar with the engine, structure and systems of the Mustang. Third, Ike has raced the bird at the Reno Air Races many, many times. Taking into consideration these elements, I don’t think there is anyone in the world today who knows as much about the “Ace Maker” of World War Two than Ike Enns. After waiting all Winter and through the early part of Spring for the perfect confluence of weather and scheduling availability, the day to do our “walkaround” of the “51” finally arrived. As it panned out, though, this was three days prior to Ike and Liz having to leave for Canada for the Summer. They had a million things to accomplish before heading North. Oh… And, it was Ike’s Birthday with a party being thrown later that evening… Nonetheless, Ike knows how to FOCUS and once the three of us were out on the ramp it was magic time. 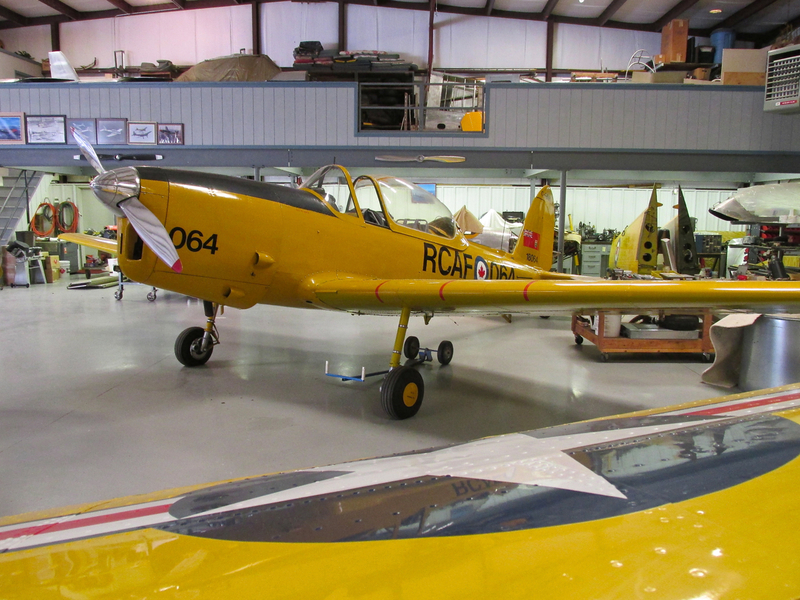 While Ike was tying loose ends together prior to our “walkaround” interview time, I took a few snapshots of just a few of their beautifully restored and maintained aircraft. 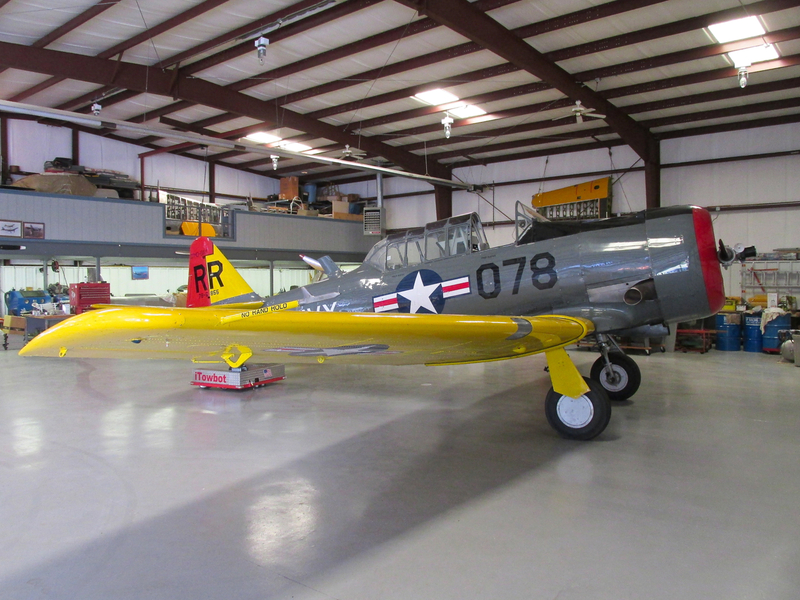 …and in the other hangar, the American T-6 – only fitting for a couple who divides their year between the two great nations. 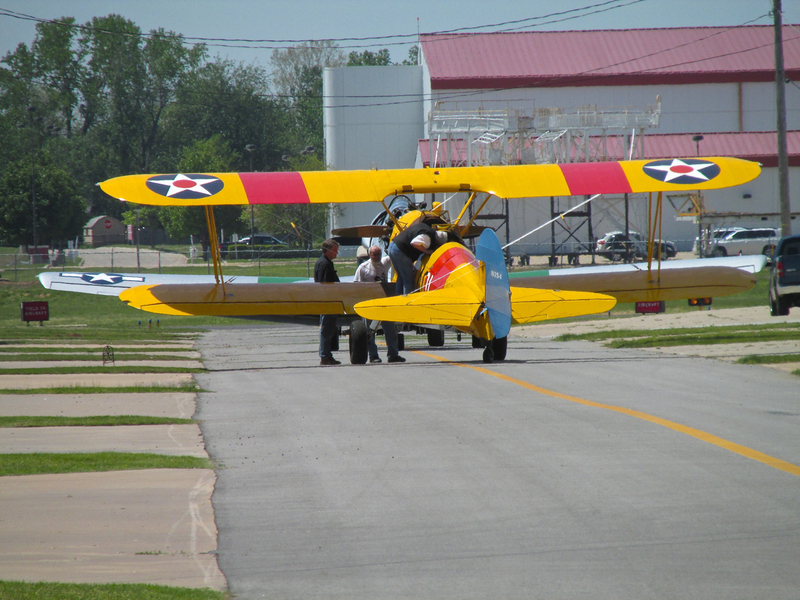 To give you some feel of the character of Riverside Airport, while I was “snapshotting” some of Ike’s planes, down the hangar taxiway from his hangar, the fine Stearman you see above was rolled out so the owners could start up the engine. There are machines like this all over the field. OK. The trip to Tulsa was “A Hit”. 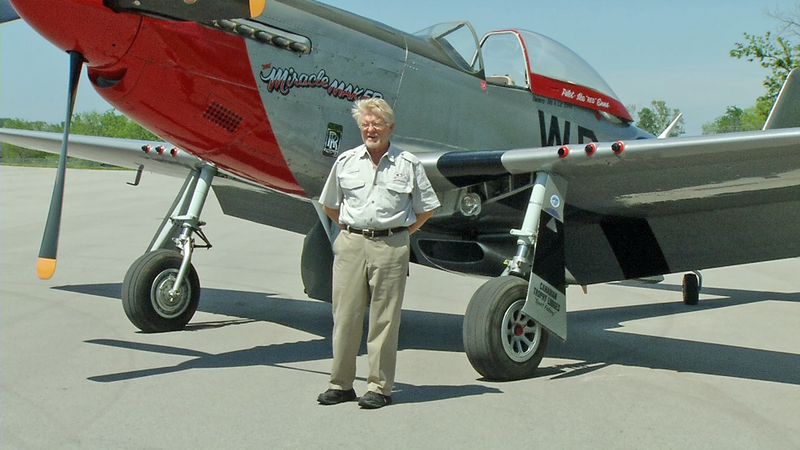 Ike was able to discuss many interesting things about the famous Mustang and I got it all on camera for later editing. Now for the “Miss”. 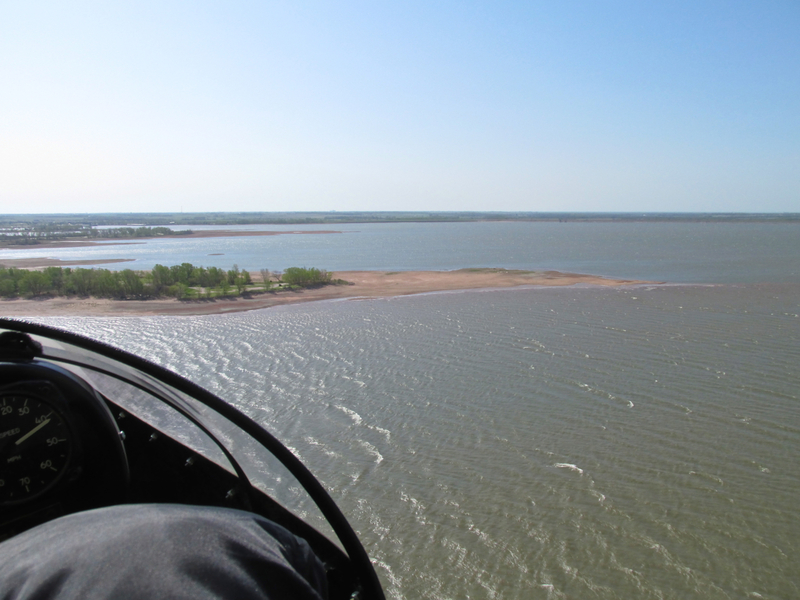 I had planned my second Ultralight Adventure of the 2013 Flying Season for the following Saturday. My destination was to be Ellinwood, Kansas, a stop on the famous Santa Fe Trail. As always, I had checked the weather forecast before embarking on the journey. The winds were supposed to be from the North Northwest all day. 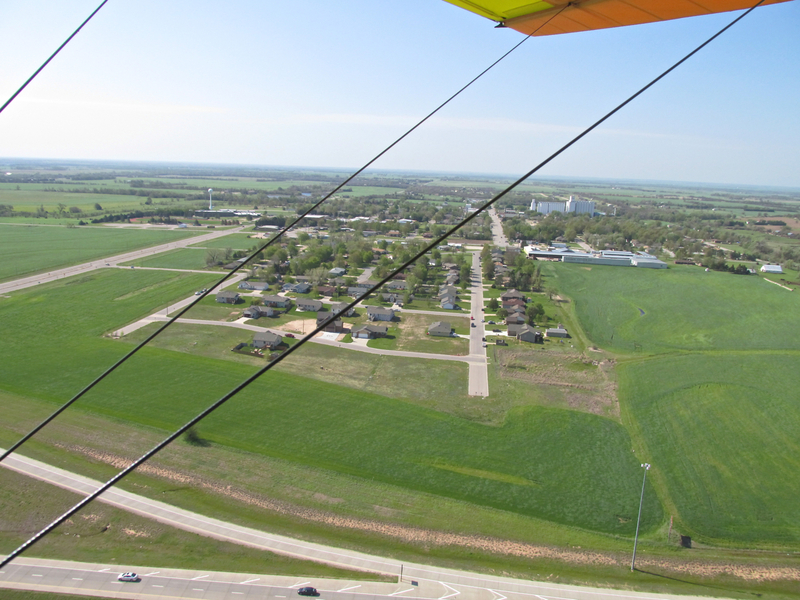 As per The Sky Surfing Formula, I would take off at Sunrise to fly “under the wind” to Ellinwood and then ride the wind back after spending some quality time there taking in the sights. Just before sunrise. I pulled off Hydraulic Blvd to grab this image. Dead Calm. A little farther down, Hydraulic crosses “The Big Ditch”. 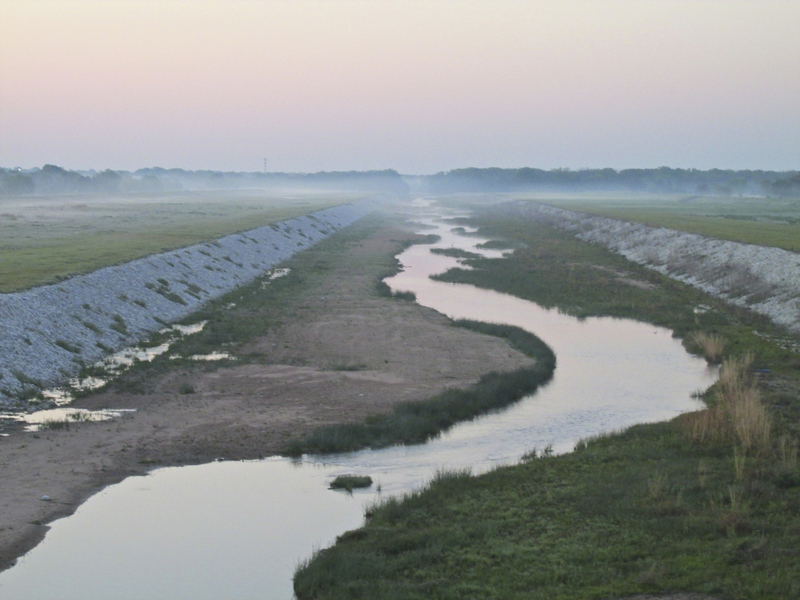 This is the excellently maintained levy project that keeps the Ninnescah River from flooding the west side of Wichita when it rises from heavy rains. Just to drive home the point, here we see The Selby Aerodrome windsock hanging limp in the foreground with my Quicksilver MXL and more ground fog in the background. 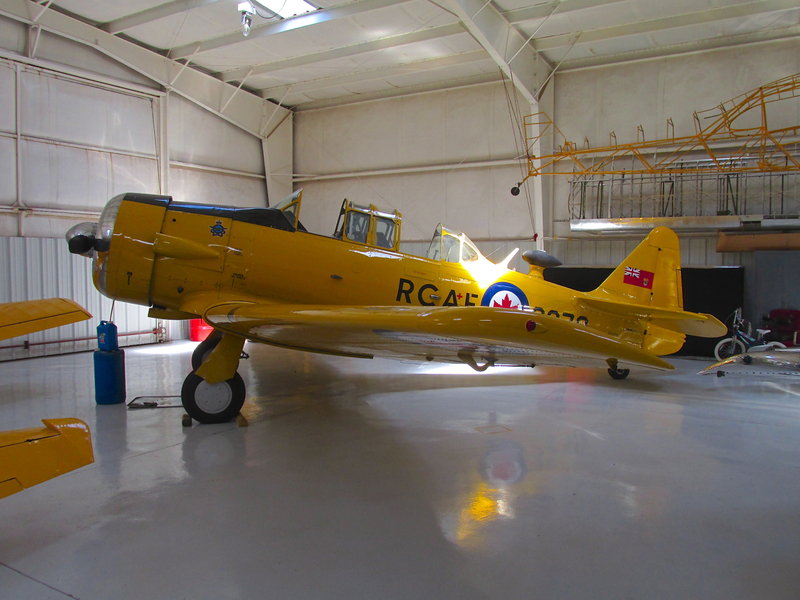 I had come to the hangar Friday afternoon to do a meticulous pre-flight. This allowed me Saturday to roll the plane out, warm it up and “hit the “High way” without delay. Although the temperature was already in the mid 50’s, I stuck with my plan and wore my snow suit. (The Sky Surfer hates to be cold when riding the waves) This time of year the temperatures can vary significantly from the surface up to 1,000 feet. I have been stuck flying in the cold wearing a t-shirt ONCE and never forgot it. Since then I always overdress. Everyone on the planet has seen “The Wizard of Oz” and therefore knows of The Emerald City. I am convinced L. Frank Baum was inspired in his naming of this fabled city by traveling through Kansas in the Springtime. If he was able to fly above it in the wizard’s balloon, I AM CERTAIN OF IT. 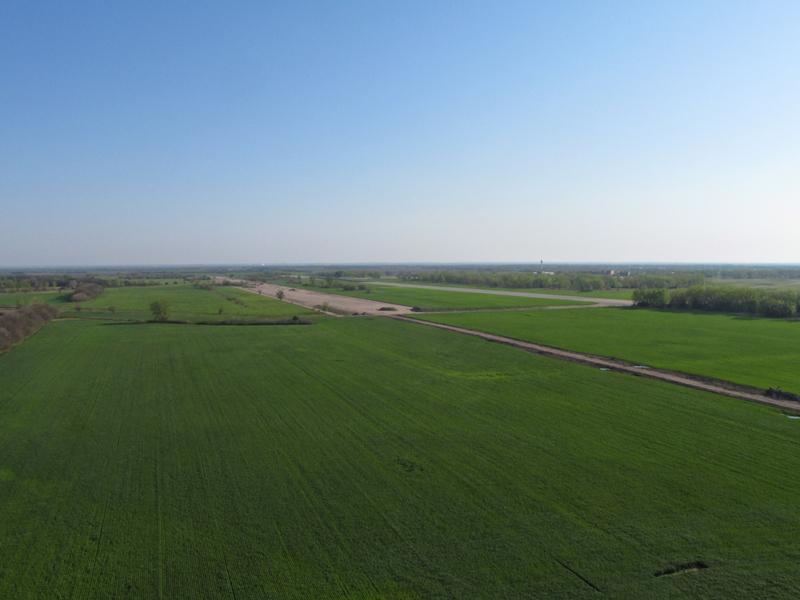 Following are some photos to help reveal the emerald green beauty of new wheat. 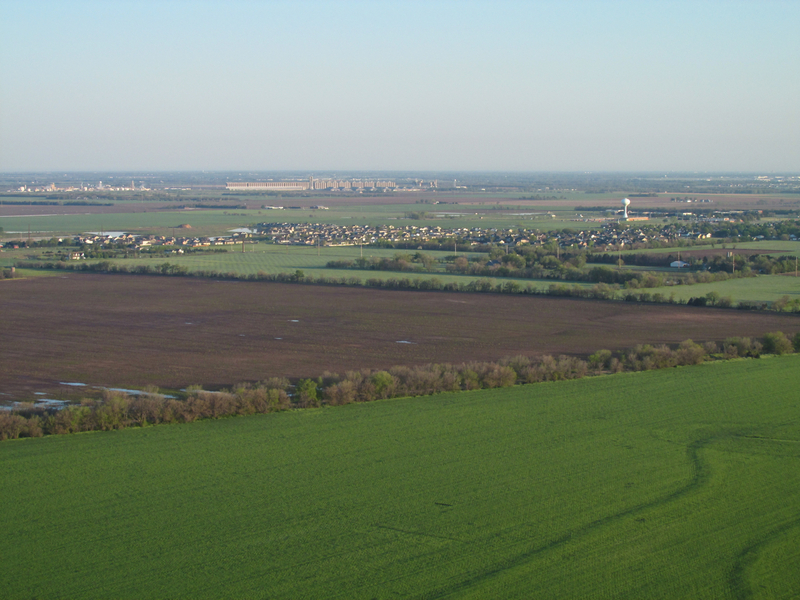 Goddard, Kansas, home of former Congressman Todd Tiahrt, as seen from 1,000′ AGL looking West Southwest. About the time I took the picture above I received a good jolt from a wind gust almost directly out of the West. You can see from the shadows that it is still pretty early in the morning. I had not expected the wind to increase in velocity quite this early. 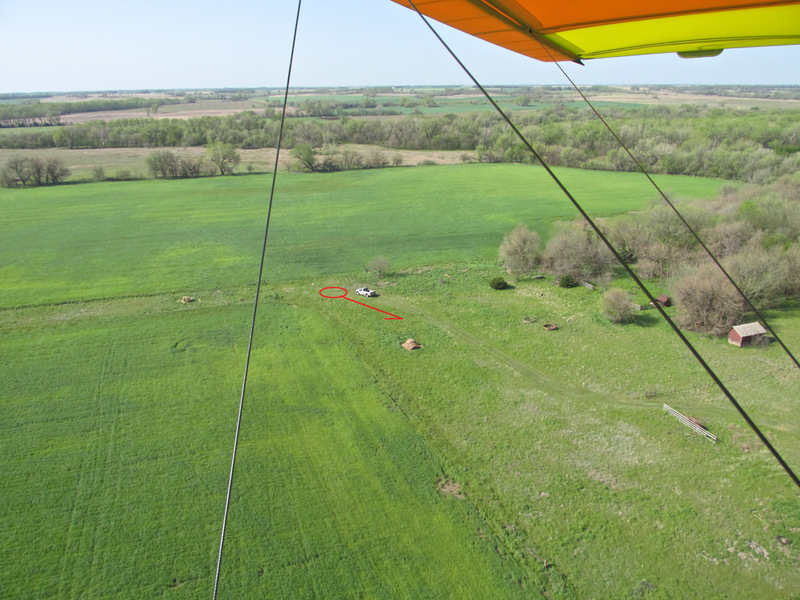 The way to avoid wind is to drop down to about 75′ AGL (Ultralight Flight Level 75) and get under it. America is home to all types. There’s City People, Suburban People, Swamp People, Country People, etc. In this list, the differences noted are based on the type of environment folks have chosen for their living space. “City People” may look at the scene below and declare it “wide open prairie”. Not so. There are parts of Kansas over which I have flown wherein a vista of this magnitude might not reveal a single human habitation. I’m not saying it is crowded. What you see below definitely qualifies for the “rural” label. The problem for me on this particular day, though, was that it did not provide me the “elbow room” I require for a “nap of the earth” flight under the wind. I took the picture right after passing the Goddard area. 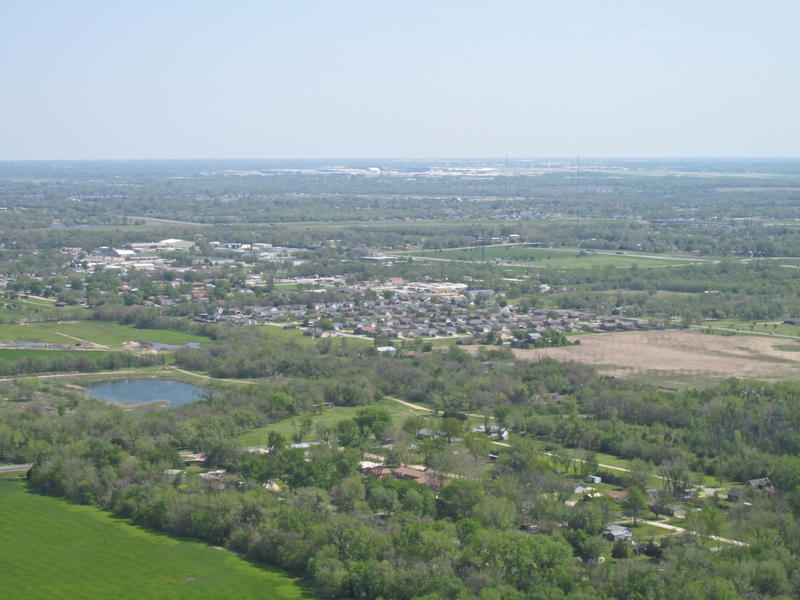 FAA Regulations require one to fly specific heights above and to the side of populated areas. We are not to buzz people’s houses. This is quite reasonable and I obey these restrictions. It is really just common sense courtesy. 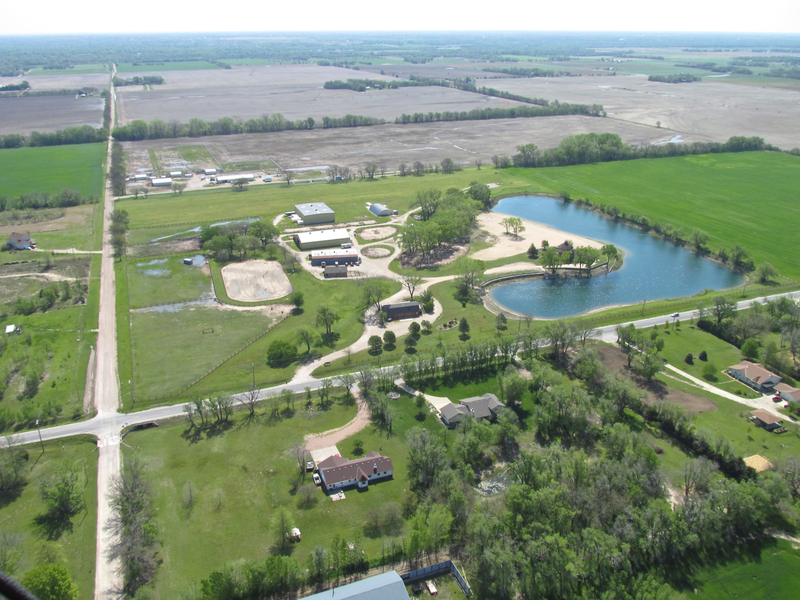 The problem was that I did not expect the higher number of farmsteads in my path to Ellinwood as there are. 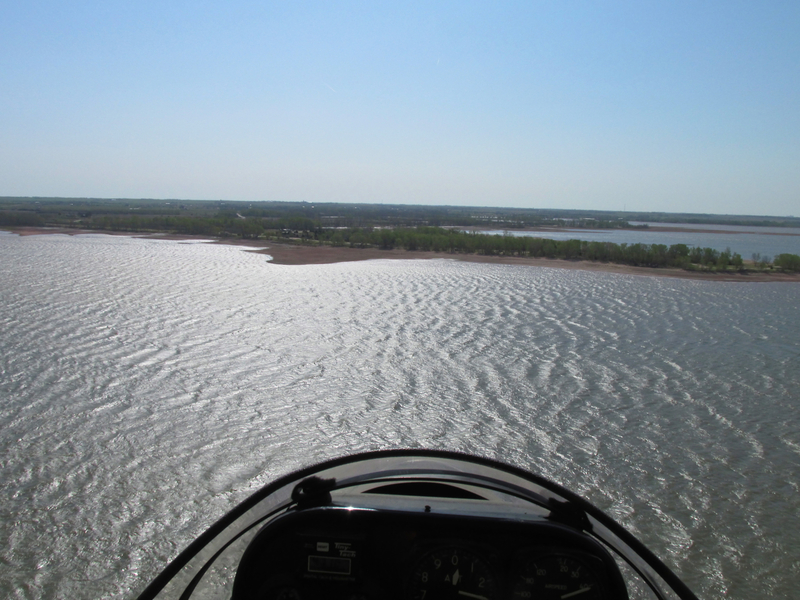 Last year I flew to Great Bend, which is fairly close to Ellinwood, and was able to make a relatively straight course at low level without having to skirt very many farms and cattle herds. I assumed the path to Ellinwood would be the same. Wrong. The farther I headed in the direction shown in the photo below, the more I was having to make course deviations in order to avoid flying too close to farm houses or livestock. This burns more gas and thus shortens one’s range. On top of this, within 20 minutes of leaving the Goddard area the wind became downright brisk and choppy. Worst of all, the wind dropped down to the surface as it gained in speed and “choppy-ness”. A definition is in order. For The Sky Surfer, the general velocity of the ambient air is less an issue than its intermittent velocity. I don’t mind flying in 30 mph wind when it is smooth. That Saturday, though, fairly early in the morning the wind speed began to alternate from 20 mph to as high as 33 mph in quick order. That is “choppy air”. Even that would have been OK if is was smooth down near the surface. It wasn’t. So, between having to circumnavigate all the haciendas and fighting the choppy air, I was burning more gas than I had planned on. All was not lost, though, because I had the foresight to carry some extra gas in a “pony tank” behind the seat. This extra baggage is not “plumbed in” to the engine fuel system. 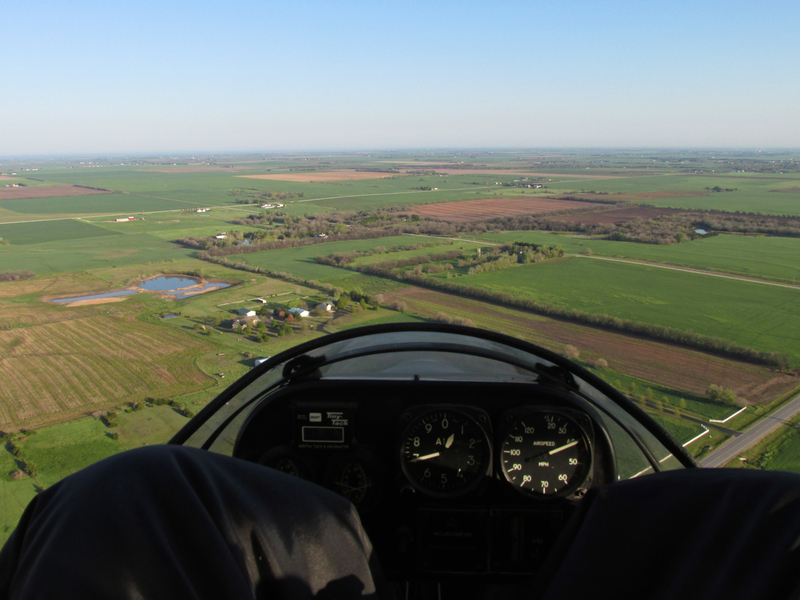 If I needed more gas to make it to Ellinwood I would have to land, unstrap it and pour it into the gas tank overhead which is connected to the engine in order to use it. All of these issues were on my mind as I continued to my destination. It wasn’t like I could really “mull it over”, though, because the wind conditions were providing my right arm and two feet plenty of “stick and rudder” practice. It’s is fun and challenging but it does engage your mind. Also, the extra physical activity inhibited my photographic efforts. That’s why I don’t have many pictures at this point of the flight. Finally, though, because I had come to the major waypoint of my journey, I grabbed the camera with my left hand to take the photo below. I must say I was doing an admirable job maintaining my course even with all the meandering. Suddenly as I passed from behind a tree row – “voila” the decommissioned Hutchinson Naval Air Station appeared off my right side. I had never been there before so I was surprised how big the runways are. It was built during World War Two and is no longer a military installation. 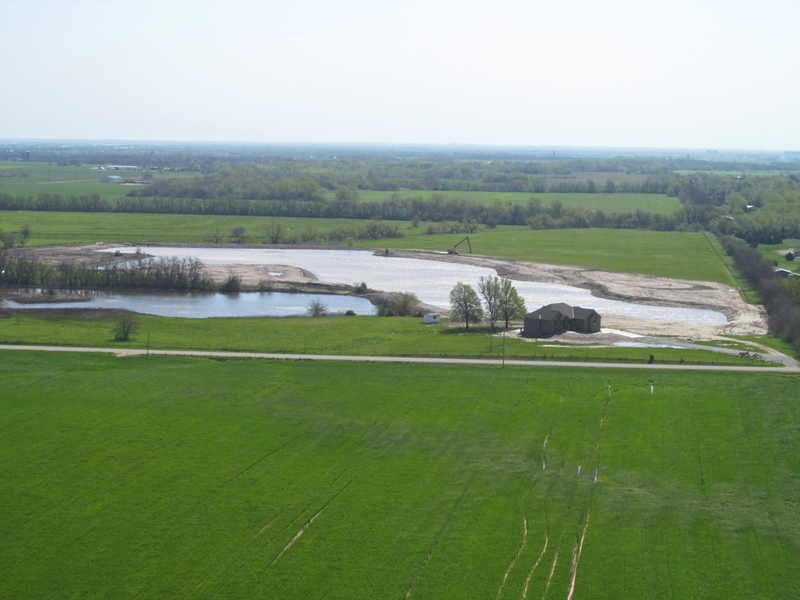 Now it is privately owned and the home of The Sunflower Aerodrome Gliderport. People have this idea that they can do a variety of tasks at the same time. The term is “multitasking”. Many are quite proud of this non-existant skill. I say it does not exist because this has been proven scientifically. Behavioral Scientists have spent great effort to study the capabilities of people under “multitasking stress”. Fighter Pilots in combat are thought to be operating at the upper limit of this perceived ability. Most people trying to drive their cars and “text” at the same time are pushing the edge of this envelope (often breaking through). The fact of the matter is that humans can only concentrate on one thing at a time. What appears to be “multitasking” is actually “serial tasking” or “circular serial tasking”. Sure, some people’s minds are naturally faster to recognize changes in various parameters than others. But notwithstanding the natural differences between people’s cognitive speeds, the real success in preparing people to cope with “high input stress” is simply training. It is the process of making your mind more efficient in the use of its “attention cycles”. Pilot training, and training for others deluged with data and a need for quick decisions, is properly a study of “ordering one’s attention”. For instance, when flying my MXL at the low power setting I use for fuel conservation on distance trips, it is important for me to maintain airspeed. Like any airplane, the Quicksilver can stall if it gets too slow. In addition, unlike most airplanes, the MXL can “mush” into the ground without making a “full break stall” if it gets too slow. So, my consciousness – NOT just my eyes – must apprehend the airspeed more frequently than, for instance, the compass. As I said earlier, the choppy air was drawing a lot of amps from my attention wattage starting early in the flight. It’s not like I forgot everything else but, I pushed “nonessentials” back in my mind until I had to deal with them. About 20 minutes past the Sunflower Gliderport, I could no longer avoid the fact that the gas was getting low. 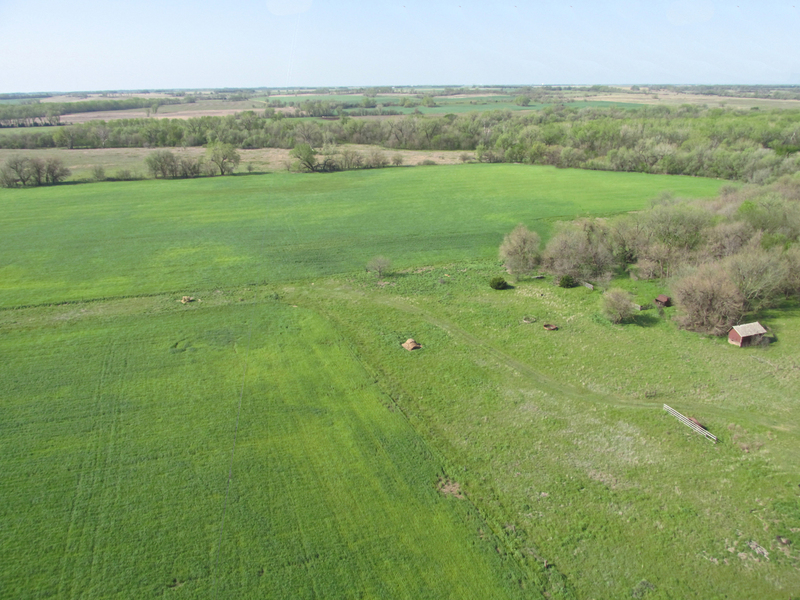 A. I could continue the course toward Ellinwood and hope to find a suitable unplanted field to land on with a solid hedgerow on the North side for a “wind wall”. I could taxi into this “wind shadow” so the plane wouldn’t tip over or on a wing while I added a couple of gallons. I knew this would provide enough fuel to get to Ellinwood. B. I could temporarily leave my trip course and circle around until I found the type of field described in “A”. C. I could head back to the Hutch Naval Air Station. I saw some perfect tree rows next to the East runway for “wind shadowing”. Initially I decided on “A”. I continued on the heading for Ellinwood. Not too long after making that decision, everywhere in that direction suddenly became less than optimal for an Ultralight landing in gusting conditions. Most of the fields were planted with new wheat and the ones fallow had no hedgerows. 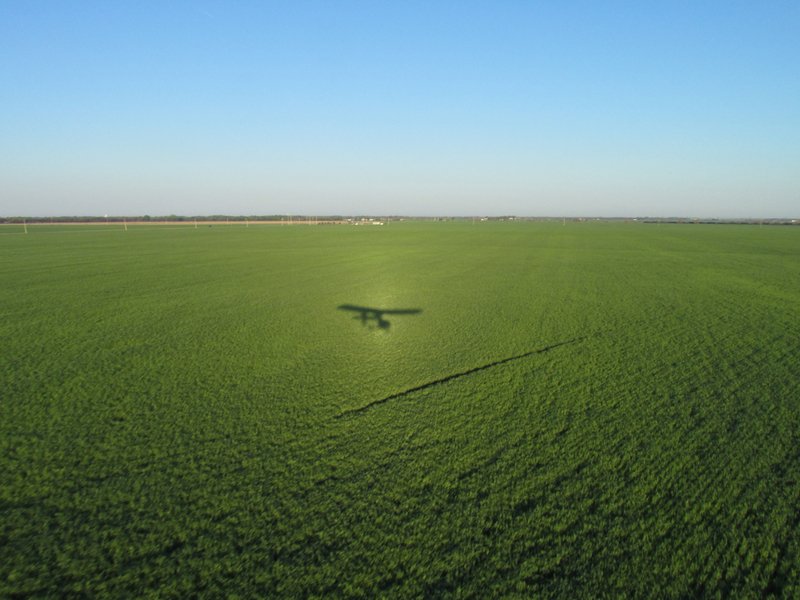 Thus far in my Ultralight Flying, I have not landed in anyone’s new wheat. It’s not that I couldn’t pull it off, it’s that I’m concerned that it might kill the crop in that spot. I would feel obligated to find the owner and make restitution. 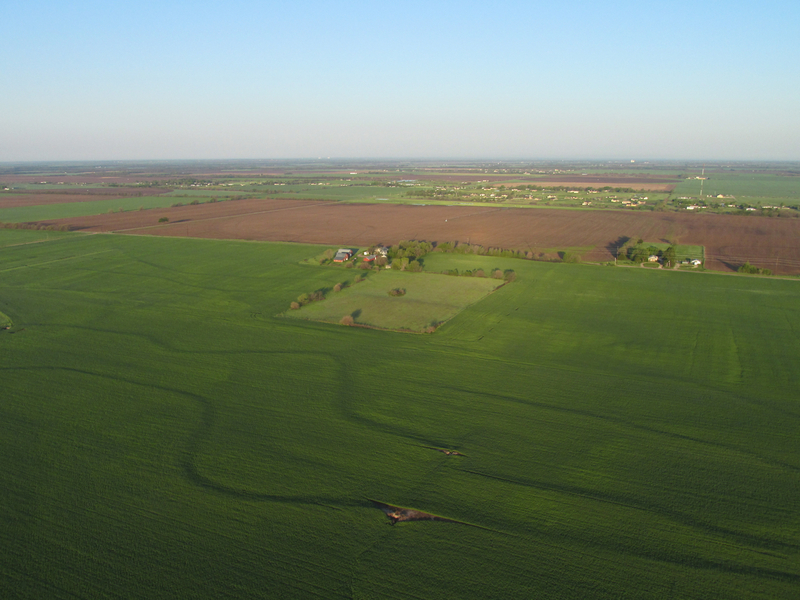 Finding the owner of a field can be no small matter… Besides the “green wheat fields” issue, ahead all the trees had suddenly faded away. Open Prairie. NOT good for refueling in this type of wind. I wrote extensively HERE why I am so careful with the Quicksilver on the ground in the described gusty conditions. So I went to plan “B/C”. I turned back toward the Hutch Naval Air Station but continued to scan in case a suitable field presented itself prior. I wanted to backtrack as little as possible still thinking to make my destination. I saw this overgrown “driveway” below of an abandoned farmstead directly in front of me. The wind is behind the direction of the photo. This was PERFECT! Just after touchdown the wind subsided for a moment. I turned the tail into the wind and sprinted across the grass to take this shot. The MXL is still on the driveway. While not ideal, the landing spot was good enough for the purpose. 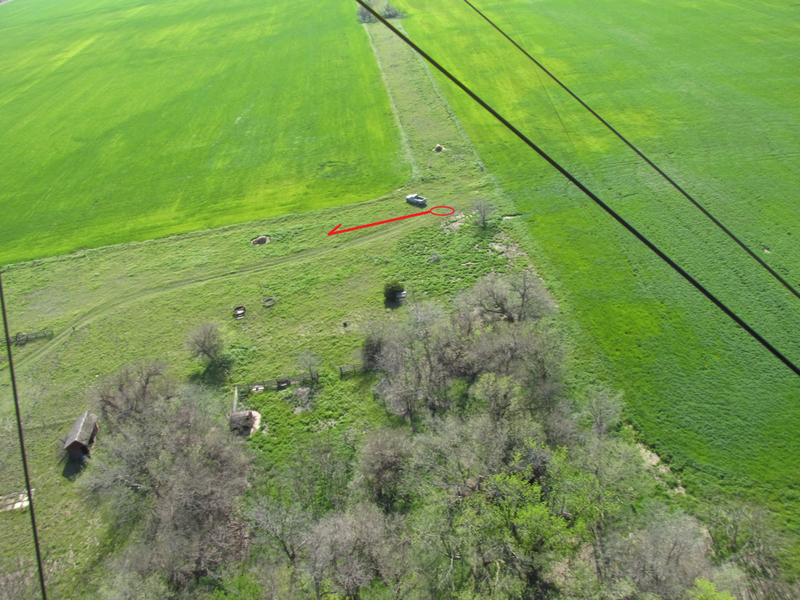 I touched down on that path you see just above the hay bales in the earlier aerial shot. Because the wind was about 22 mph gusting to 32, after touchdown I barely rolled at all. The tall grass assisted my braking considerably. I de-planed and immediately turned the MXL’s tail into the wind. Initially I began to drag the tail closer to the hay bales for “wind brake” assistance. But, the grass was so high and the ground so spongy, the plane was pretty well anchored after pulling it about 10 feet. So, I left it there and commenced to pour the contents of the “pony tank” into the main fuel tank. After doing that I was dismayed to see how low the fuel level still was in the tank. The “treeless prairie” I had just seen in the direction of Ellinwood was weighing heavily on my mind. If I had to land again out there, the potential of “ground rollover” after de-planing was significant. Suddenly overhead appeared what some might consider a bad omen. I, instead, was delighted at the comedic element it would add to this moment in the travelog. 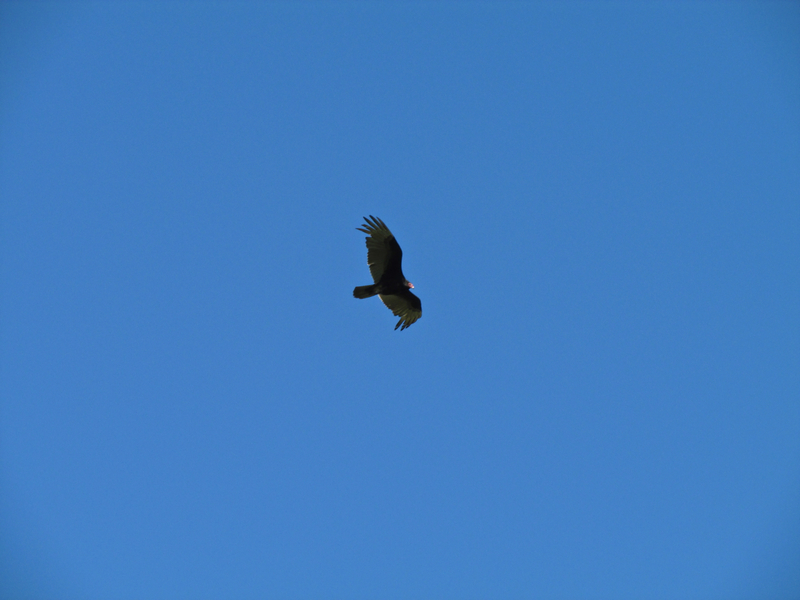 Soaring over my head, keeping an eye on me, was this magnificent Kansas Turkey Vulture. “Get There-Itis” is an oft discussed fever of the brain peculiar to aviation. It can make you mess up. I had to take a big dose of mental medicine to quell this fever. I really wanted to get to Ellinwood. To compound things, I had never turned back from a mission (OK, Fun Flight) before. It wasn’t an issue of getting hurt or anything like that. I have no doubt I would be able to land if the headwind caused me to run too low on fuel again before reaching Point “B”. 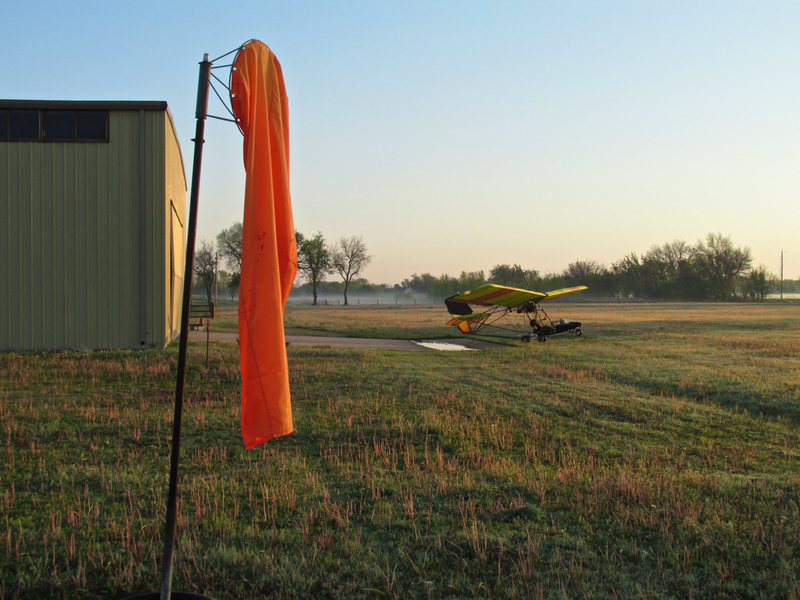 The problem that loomed in my mind was the possibility of having to land in an open field. Then I would have to use the stakes and tie downs I carry behind the seat to secure the MXL to the ground. Then I would have to search for a farmer to sell me some gas. This prospect, however remote, was extremely unappealing. Worse, I would find it very hard to forgive myself if I did all that and then the wind flipped my plane over while I was getting gas. That would be really stupid and also would violate The Prime Directive of Fun Flying: HAVING FUN! So, after some deliberation, I decided my visit to Ellinwood would have to wait for another day. Even though I was finally able to contain the beast within and resign myself to an “aborted mission”, I was still disturbed that I now had the distinct possibility of running out of gas on the way home. I knew I could make it to Rucker Field but there is no fuel there. Most of the time when I fly over it there is no one around either so I would have to call one of my buddies to bring me some gas. MAN, two ego-killers in one day – way, way, way over my quota. These weighty matters burdened my mind as a brilliant flash came across the transom. When Rotax Rick (story HERE) rebuilt my motor last Winter he set the fuel/air mixture quite rich to aid the engine “run-in” process. My engine temps have been in the “refrigerator range” so leaning the mixture would not be a problem. I very carefully opened the carb and lowered the needle a step. This was quite a feat in itself as the gusty wind was pushing hard enough on the rudder that I had to hold the tail in place all the while. In addition, there was a very real possibility I could drop the spring, the needle or the needle clip into the grass. That would be a “grounding error” – No Carb – No Fly. I focused like a laser beam on the task and completed it flawlessly as the wind continued unabated. 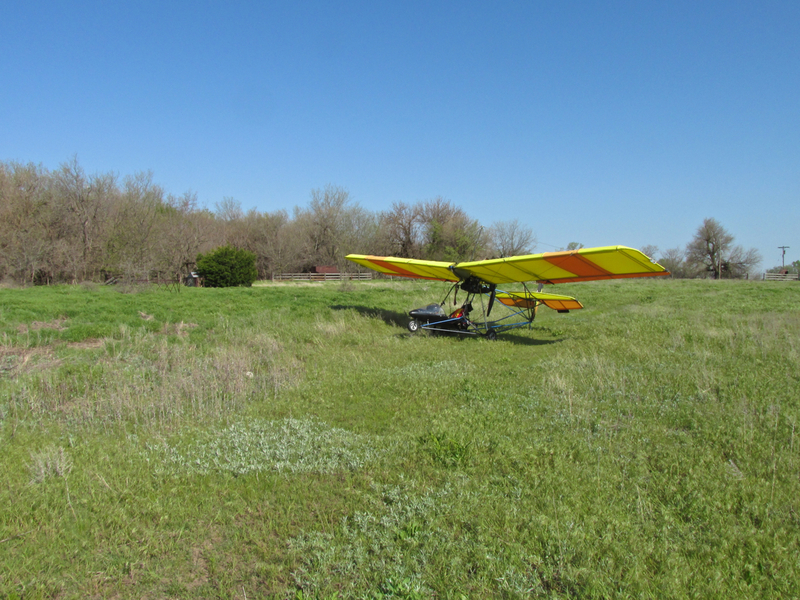 I decided I would start the motor with the tail into the wind and then see if I could taxi through the tall grass and make a 180 into the wind for takeoff. I left my seatbelt undone during this procedure in case the wind picked up a wing. My thought was that leaving my seatbelt off during this phase would enable me to get out faster to pull a lifted wing down. The taxi and turn worked perfectly so I looked down to get my seatbelt fastened. Wearing a helmet and the snowsuit requires both hands and both eyes to align the seat belt and snap the latch. I was now ready to pour on the coal and pop into the sky. But, as I looked up from the seatbelt, toward me down my “runway” came a pickup truck. I knew it would either be the owner of the property or a passerby curious to see the big yellow bird settled at the abandoned farm house. I shut everything down. The driver got out of his truck and came over as I took my seatbelt and earmuffs off. I offered my hand and introduced myself. To my question he answered that it was his land but it was fine for me to be there. He said his name was Stuckey but I cannot remember his first name. Mr. Stucky said he saw something yellow from the road and came to investigate. I told him I would love to show him around the plane but it was so windy I was afraid to step away from the wing. He said he was amazed a “thing like this” could even fly. I told him he would be amazed to see how quickly it would climb out of his field once I powered it up. As if on cue, a gust suddenly lifted the left wing and main gear about a foot into the air. We both lunged for the leading edge spar and stabilized the craft. I said “Nice to meet you, sir. Thanks for letting me land here but I gotta go”. He produced a huge smile and said, “Yes, you do”. I gave him one of my business cards. He wanted to help so I asked him to hold the wing while I started the motor. One pull and it was idling again. I moved as quickly as possible back into the seat and strapped in. Mr. Stuckey made a gesture like “What do you want me to do?”. I had already surveyed the scene and decided I didn’t need him to back out of my “takeoff trail”. I know the Quicksilver like a Cowboy knows his only horse. I showed him with my hand that I would take off through the grass between his pickup and the hay bales. He nodded and I gave him “Thumbs Up”. I reached over with my right hand and slowly brought the throttle to 100% while my left hand held the brakes. I waited for the next gust I was sure to come. When it hit, I released the brakes and bounded into the air with the shortest of ground runs even with the tall grass tugging to keep me down. The view over my left shoulder right after takeoff as I initiated my turn downwind. I had the camera in hand so I snapped this shot as I swung around with the wind. Mr. Stuckey was turning his truck to keep me in view. Flying the MXL home with a tailwind is one of the truly blessed events in my Fun Flying world. Of course there is the expected benefit of additional speed and “better gas mileage” but it also engenders a feeling of “oneness” with the environment. It is truly a time of “going with the flow”. It is like part of God’s Creation is helping you on your way. This day, though, the tailwind was a mixed blessing. The strong wind was wanting to blow me down to Harper, Kansas, way down South Southwest of my home field. If I let the tailwind have its way I would miss Selby Aerodrome by many miles. As the morning progressed, the wind had come way around from the West to now blasting from the North Northeast. A quartering tailwind is good thing but a certain amount of energy must be expended to cut across it. My plan was to fly as low as possible because, while choppier, the velocity was lower down there. Normally this would not be that big a deal but on this day, the 2/3 full fuel tank loomed large in my mind. I really, really, really didn’t want to have to land early and try to get someone to bring me some gas. The degree to which I could negotiate the quartering tailwind – using it to my advantage – while expending the least amount of fuel would be the challenge of the day. While my Rotax engine has proven to be a masterpiece of dependability, it is still wise to fly any 2 stroke powered aircraft as if you may become a glider at any moment. A corollary to this is to avoid forests and lakes. As I have already proved in this article and many other times, the Quicksilver can land pretty much anywhere in Kansas except a forest. It can land in a lake but that would be the end of it. Retrieving a plane from water is a daunting task and even if successfully accomplished the plane is typically a total loss. Right before take off, during our short conversation, I was curious how close I had been to making my landing at Hutchinson Naval Air Station. Mr. Stuckey pointed Northeast of our position and said “Three miles that way”. If you look on a map, that put me North Northwest of Cheney Lake. The prevailing tailwind wanted me to go over the center of the lake. While I did not do that, I expended just enough gas so as to only cross the two little “arms” that reach out of the lake to the East. I tried to go around this inlet to the left (East) but pointing the MXL more into the wind slowed my groundspeed to about 10 mph. I did not want to use that much fuel just to avoid going over the edge of the lake. Rotax did me well regardless. 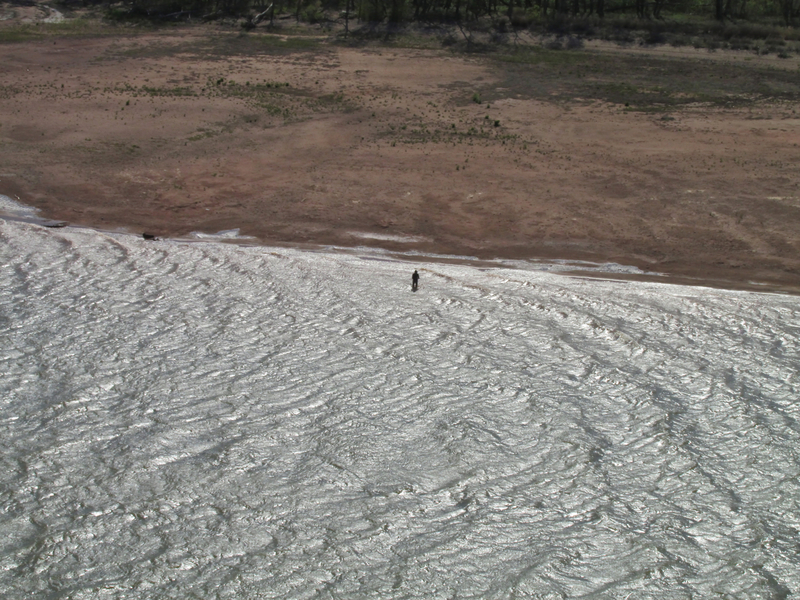 Recent rains have increased the water level in Cheney but it is still low enough to reveal these long sand spits. Just like “Lucky Lindy”, I finally crossed the body of water. Two guys were at the water’s edge. I think they are seining for fish. The rest of the flight back to my home field would have been a lot more fun had I not been continually “on edge” regarding my fuel resources. I continually crabbed left (Easterly) against the gusty, quartering tailwind using the absolute minimum power required. The process required constant attention. After crossing Cheney Lake the landscape opened up enough that I didn’t have to worry about passing too close to habitations. Then in about 10 minutes that changed when directly in front of me I saw this sparse housing area directly in my path. One of the homes had a large, unusually tall, odd looking, oblong building behind it. I couldn’t figure out what it was until – it hit me. I had been there before. It was The Eagle Valley Raptor Center. The guy who owns it rescues injured raptors. 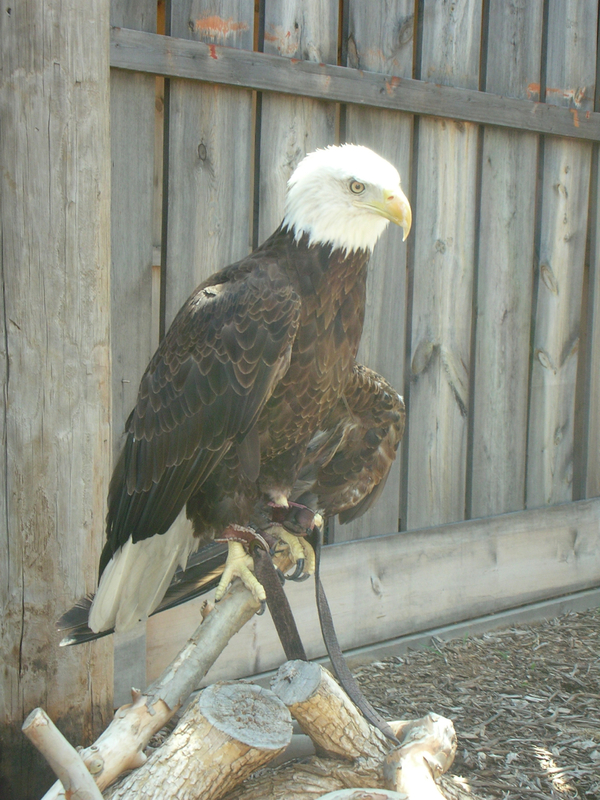 Seven years ago I had an advertising client who likes to feature The American Bald Eagle in his advertising. Since the 1960’s, the federal government has put enormous restrictions on interaction with this National Symbol. We knew this but I set my mind to see if I couldn’t engineer a video shoot with one perched on my client’s arm. After a good bit of detective work I found the EVRC and visited it. I took a lot of pictures. It is a very interesting place. So as not to cross over it, I altered my course to pass The Eagle Valley Raptor Center to the West. 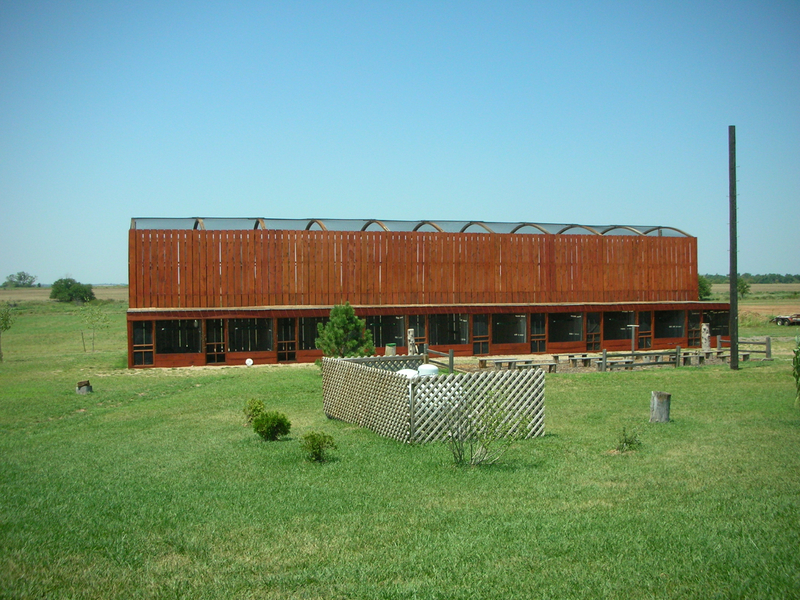 Here is a picture of the “bird cage” when I visited there in 2006. I circumvented the Raptor Center and environs. But then, five minutes later, Garden Plain appeared directly in my path. It’s a great little town but this day I wished it were not there. I would not be able to cross over it. In addition, Highway 50 is adjacent to it on the North and I had to climb over it so as not to buzz traffic. I took the picture shown below whilst now confronting a quartering headwind. My ground speed dropped to 12 mph during this detour but there was no alternative. In the final analysis it was a negligible fuel expense. 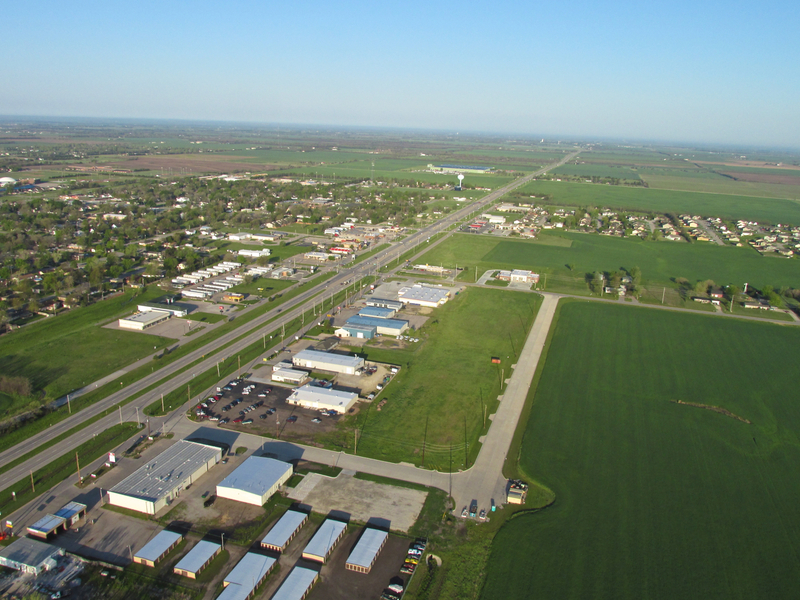 Garden Plain, Kansas from 1,000 feet AGL looking South. Highway 50 is in the foreground. Just past Garden Plain I noticed this infrastructure improvement. 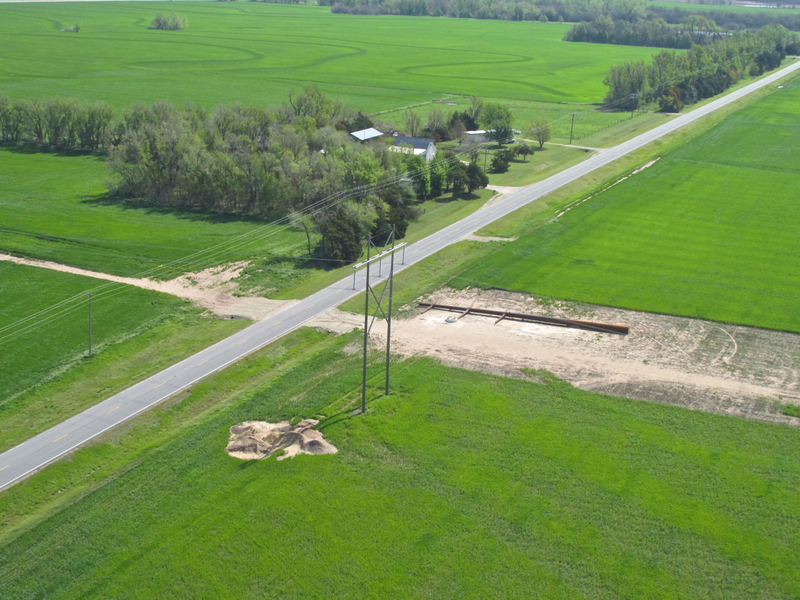 The new poles will allow at least three more power cable strands than the old ones. By now I was starting to relax. I was making good headway and had about 1.5 gallons in the tank. It was obvious I could make it all the way to Selby Aerodrome without having to divert to Rucker Field. 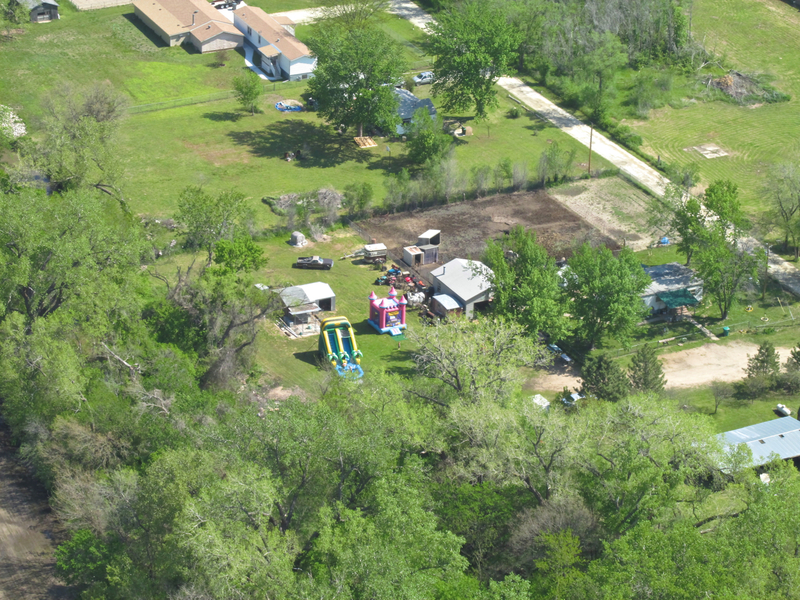 North Northwest of Rucker Field is this property. Last flying season I noticed the steam shovel. It was never at work when I flew by. At first there was just a small hole in the ground as if for a foundation. As time passed it looked to be a small pond. Now, it is a good sized lake. It looks like they are about done digging. An amazing feat for one machine. On the home stretch I decided to see if my camera could capture a “compression shot” that caught my eye. Properly done a “telephoto perspective compression shot“ requires a much longer focal length lens than I have on my Fun Flight Utility Cam. But, like my best advice to budding photographers: try things with your camera. Back when we were shooting 35mm film, it took more persuading. Now, firmly in the digital age, there’s no excuse. I took my own advice, tried the shot a few times and one came out OK. I was at 800′ AGL looking Northeast. As you can see, there was a lot of humidity still in the air. These parents rented not one, but TWO, inflatable fun houses for their child’s birthday party. I have found this to be more common than one might think. In my Fun Flying Travels, I have seen a good number of similar car collections. This one looks to be focused on the 1970’s. As I approached my home field, Selby Aerodrome, I thought it looked particularly attractive that sunny morning. It was 11:30 am. I took a few shots while approaching from the West and thought this was the best. 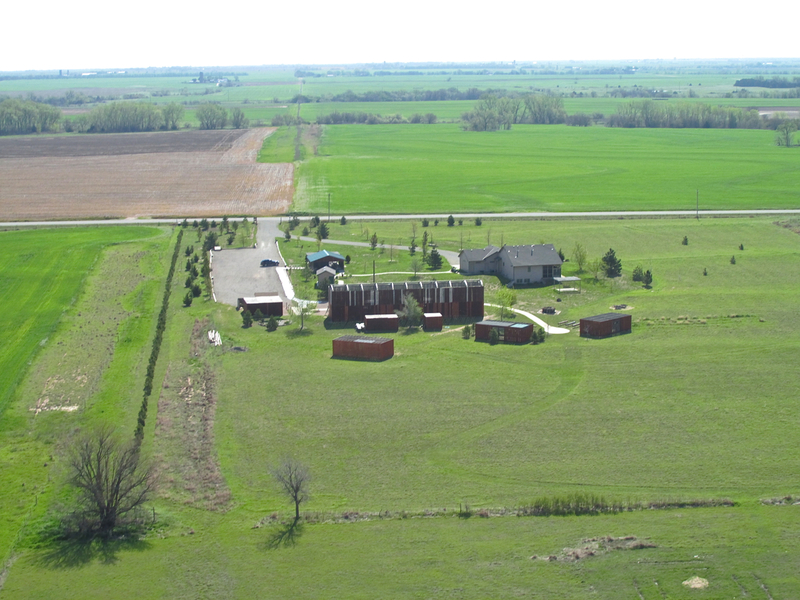 This picturesque place on the prairie is more properly described as Selby Stables and Aerodrome. 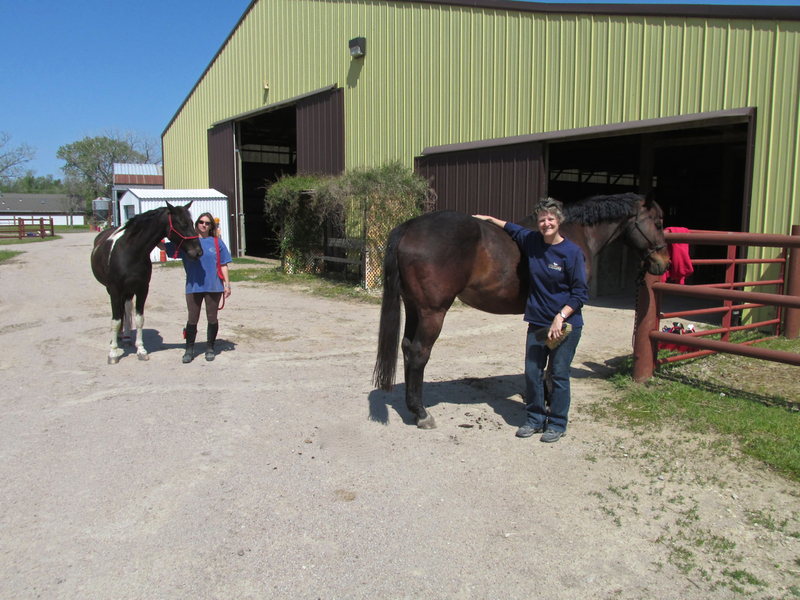 Susan Selby does an admirable job keeping the place in great shape and providing both horse and airplane owners a fine place to park their steeds. Airplanes need horsepower to fly, so perhaps that is what ties it together. 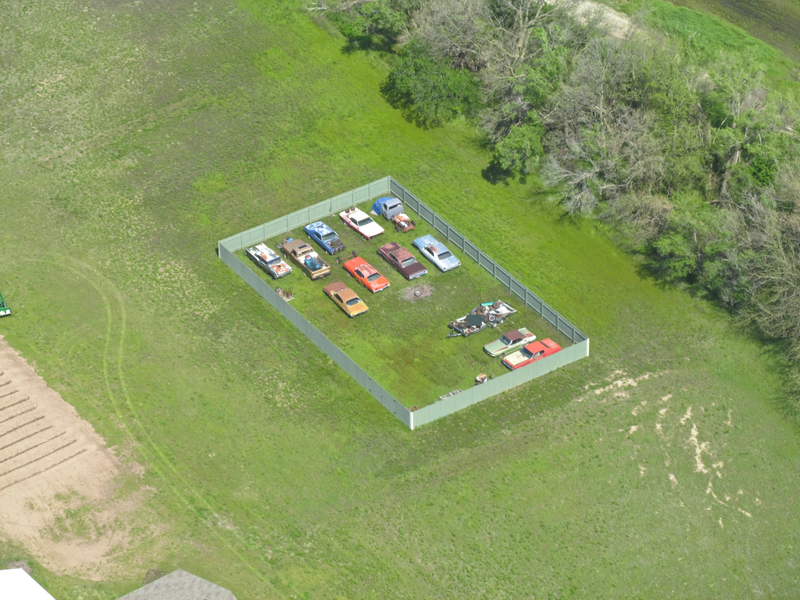 Selby Horse Stables and Aerodrome as seen from 1,000′ AGL looking East. 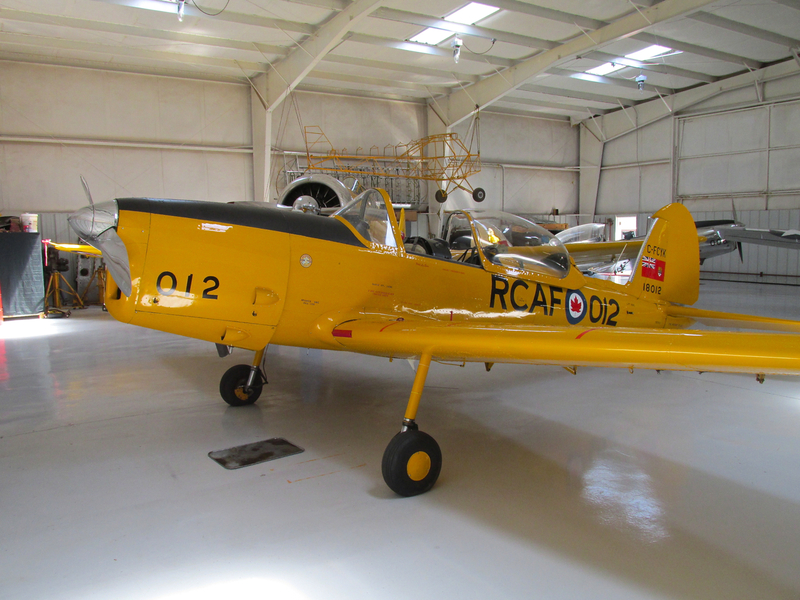 It was still quite windy and I had to land on the leeward side of my hangar to de-plane in its “wind shadow”. After opening the hangar’s bi-fold door, I re-started the motor and taxied inside “the livery”, finally able to relax now that the wind could no longer upend my Quicksilver. Just before doing this, some of the ladies at the stables nearby had looked up from grooming their horses and waved to me. Although I couldn’t hear them very well, I got the impression they were interested to find out where I had been. I walked over and we talked for a bit about their horses and my plane. I learned a little bit about their hobby and they learned a little bit about mine. This is what The Founding Fathers meant when they said we should be free in our “Pursuit of Happiness”. Everyone was having a great time doing what they like to do on a Beautiful Saturday Morning. It also seemed like a good “photo op” (for The Sky Surfer – what isn’t a good photo op?) and a perfect close to the story. Sarah with her horse “Jack” and Katie with her horse “Romeo”. Excellent article on a very interesting odyssey. Your picture are great, especially the ones taken of the inside aircraft. PS: As you expect for England, we regularly get such fog. When I use to jog, I have on occasions had run with my head bent down because the mist was ‘hovering’ at around 6 foot high. Even run with my feet in ground level fog of about 18 inches – eerie! Thanks. Good to hear from you. It was an interesting journey. 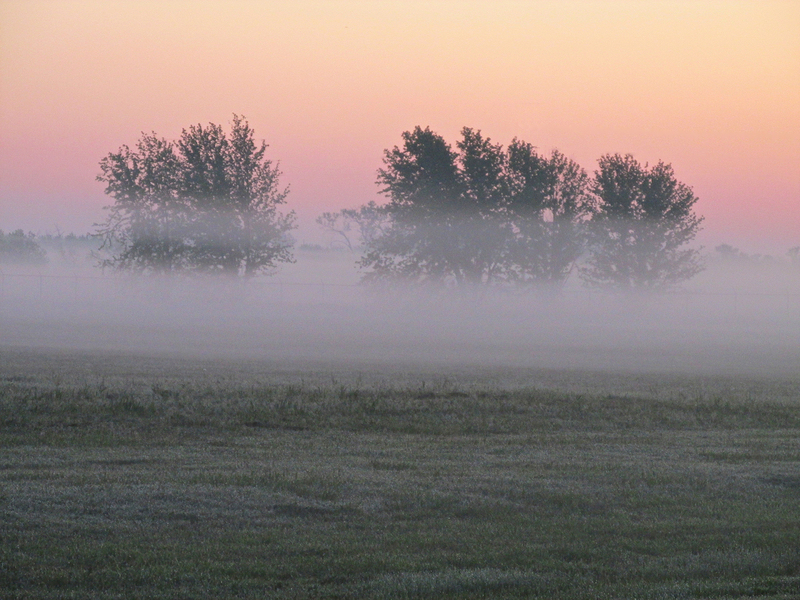 Of course here on the plains we have little to compare with England when speaking of fog. But, I flew to Beaumont, Kansas yesterday morning and the visibility was about 1-2 miles due to very high humidity. This time the wind was continuous and steady from the Southeast. I had never flown that long in weather like that. I took a lot of pix but have not had a chance to review them. I’ll write the flight up this week and give you the details.